When you are seriously injured in a crash that wasn’t your fault, you may not think it matters if the at-fault party was driving a car or truck. After all, if the other driver was at fault, his insurance company should compensate you no matter what type of vehicle was involved. However if the other vehicle was a commercial truck, there are some unique factors to consider that an experienced truck crash attorney can help you with. How Are Truck Crashes Different? Truck crashes cause catastrophic injuries. Due to the size and weight of a commercial semi-truck, the injuries suffered by occupants of passenger cars can be devastating. Traumatic brain injury, paralysis, amputations and death are common outcomes of collisions with trucks. These kinds of injuries will require extensive medical treatment and years of continuing therapy and rehabilitation. There may be multiple liable parties. Because a trucker is performing job duties when driving, his employer may be partially liable if there’s a crash. 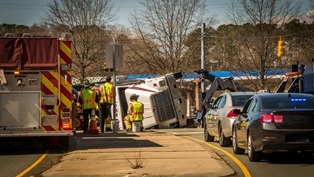 If the driver was unqualified or under stress, or the truck was poorly maintained or loaded, the trucking company could be held accountable for the crash, as well as the driver. Any third parties that may have been involved in repairing or loading the truck could also share blame for a crash. Large insurance policies are involved. While the driver of a passenger car may only carry the state’s minimum insurance coverage and, therefore, only be able to compensate you for up to $30,000, a trucker and his employer may be insured for millions of dollars, increasing the available compensation. If you are seeking compensation for injuries sustained in a truck crash, only a truck accident attorney will have the experience necessary to fight for maximum settlements and win. The truck accident attorneys at Parker Law Firm have the skill to handle your truck crash case from beginning to end. Call to schedule your free consultation today.